We’re taking the rest of the week off. Please enjoy my touching, heart-warming, moving, uplifting and nausea inducing prose today. Oh yeah, we’re supposed to reflect on our lives and consider everything that we’re thankful for as well. Brace yourselves readers; here comes one of those sappy posts where I reminisce about the year. This blog is supposed to be about money, so let’s start there. The S&P 500 is only up 1.5% for 2015, so the markets aren’t going to turn in a monster year like 2013 or 2014. However, we’re members of the Double Comma Club and my portfolio sits at an all time high ($1,081,625). I’ve been kicked out of The Club at least 10 times this year, but every month we’re saving at least $5,000. Perhaps someday, I’ll be a permanent member. I’m fortunate that these holdings, with the exception of Berkshire Hathaway, have had an exceptional year. I have a wife who despite her preference for keeping the thermostat at a scorching 89, is mostly sane. We share common goals and our fights are few and far between. Finding a compatible mate goes a looooooong way to happiness. Everyone is healthy. Besides the nasty bugs that the kids pick up from their classmates, we have no medical issues. We visit the doctor for checkups and that is about it. I love to travel and this year I’ve been all over the place. Travels include Madison (Wisconsin), Chicago, Omaha (Berkshire meeting), Charlotte (North Carolina), San Francisco, Yosemite and Pismo Beach. We have even bigger plans for 2016. 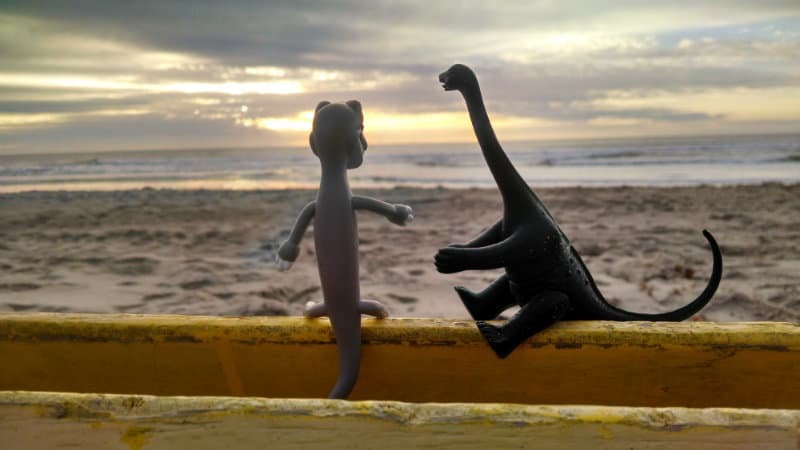 Top: The Dinosaurs take in a sunset at Pismo Beach. I told you this was going to get sappy and here it comes. Get out the Kleenex for the tears (or towels to clean up the vomit). This blog is almost three years old and with the exception of the few hate-mailers, it’s been spectacular sharing my journey with you. I had no idea where the blog would take me when I hit the Publish button for the first time on January 1st, 2013. Thinking back on it now, writing has exceeded all of my expectations. I’ve learned so much and have had loads of fun meeting many of you in person. It is no exaggeration to say that this blog has changed my life for the better. Life is good. I hope all of you have much be thankful for as well. One more thing: My friend in Switzerland who writes over at Mustachian Post asked me how to get rich. I actually know the answer to this, but I’m warning you; the answer is probably not what you think it is. Read on. Jumping on the sappy bandwagon, I’m thankful for blogs like yours that keep me motivated on my FI journey. I’m just beginning and have a looong ways to go. Thanks so much for the kind words FT. Your journey may seem long, but that is all part of the fun. Every step , no matter how small, gets you a little bit closer. Stay the course and never give up. Congratulations on the first week of part-time employment! I’m sure it feels fantastic to have reached this point in your financial lives. Mr. Money Monster and I are still a few (okay, 5, ugh) years away from having the option to go part-time or leave our day jobs. With blogs like this to keep us motivated, we will surely reach our goals. With that said, Thank You is in order to both of you for writing this motivational, yet entertaining financial blog. Long live Spendosaurus and Frugalsaurus! Enjoy your turkey day! Thanks for the kind words Mad Money! Yes, going full-time is going to be great. I feel the weight lifting and dissipating. Freudian slip (“going full-time is going to be great”)? Yikes! Maybe my subconscious knows something that I don’t? Right back at you J! Oh wow, I think your wife and I may be from the same planet. Does she by chance own a hot water bottle? If not, let me just tell you/her that this is one of the most amazing inventions ever. Whenever I’m hanging out in the house in the winter, I heat up some water, fill up my hot water bottle, and sit under a blanket with the hot water bottle in my lap. It stays warm for a long, long time, and is very cozy, removing the need to turn the heat up super high. You can order ones from Amazon that come with a fleece cover (which in my opinion is a necessity). I learned about the amazingness of hot water bottles when I lived in China with no central heating — everyone there owns one. Thanks for the awesome suggestion! Usually the Mrs. and I don’t buy each other gifts, but this sounds like a wonderful idea. Another option is a Toasty! (at least that’s what I call them…) AJ got me one as a present last year and it’s fantastic when I’m a little more chilly than he is. And I’m thankful that I’ve realized that all of my favorite bloggers are normal people like me. It meant I could start my own blog and find my own digital voice instead of remaining a lurker forever! Hmmm, I think she has this! That, or there is something that looks just like this laying around the house. Welcome to the blogosphere! I enjoyed reading about the fornicating octopi. Warm comfortable lounging all winter at minimal cost! Wow, that thing looks pretty neat. Thanks for the suggestion! Happy Thanksgiving to the 1500 family! May your drinks be even stronger when fighting with family this year! But in seriousness, I think I speak for mostly everyone when saying thank you to both of you for this blog. Who knew that personal finance could be as entertaining and interesting as you both make it! Also – Congrats on leaving the full-time work world! Thanks so much for the kind words Thias! Also, I’m so happy to be going part-time, you have no idea! Happy Thanksgiving guys! Enjoy the family time! Happy Thanksgiving Brian! It was a lot of fun meeting you this year! Awwww, I’m thankful for you too!! Seriously though, getting to know you and Mrs. 1500 is definitely a highlight of the year for me and Mr. FW. It’s awesome to meet other people so committed to pursuing their passions, avoiding consumerism, living the good life, and raising smart, kind little kiddos. Thank you for everything you guys stand for! Hey Mrs. FW! The Mrs. and I had great fun meeting you too! I cannot wait for the next one. A very happy thanksgiving to the entire 1500 family. Do elaborate on the travel plans for 2016 upon your return from stuffing your faces and fighting with the family, we are very curious! If you wind up in Edinburgh next year (which was awesome) and you like chicken wings, there is a place right off the Royal Mile which was amazing. Great food and the atmosphere was super nerdy/artsy, with each table having a theme (star wars, star trek, Jurassic park, etc) all done by local artists. Thanks for the suggestion! I do love chicken wings and I’ll be Edinburgh. Woot! Ah crap. Now I have to avoid WI and Ecuador in 2016. Oh crap, YOU’RE going to be there? A beach party in Antartica in the winter sounds like more fun. …there goes my Antarctic beach party…. Maybe I’ll sign on to go to Mars. The father away, the better. You don’t plan to have any chautauqua’s on the red planet, do you? The farther away from you, the better! Congrats on going part time! That is a big step and I look forward to reading your thoughts about the transition and new found free time! Free time? What is that? I have vague recollections of it from when I was like 8. Happy Thanksgiving! Enjoy the reduced work schedule and don’t let it creep back to full-time 😉 Enjoy the holiday! Eat lots! Thanks Fervent! I will be eating a lot, but I hope to be funning a lot too. Happy Thanksgiving. Thanks for a year of great humorous and educational posts. Have fun with the in-laws, don’t push your crazy uncle too far over the edge. Congrats on going part-time, one step closer to RE! Thanks OK! If I don’t return after the holiday, you know something went terribly wrong and no one would bail me out of jail. First up, finish the house. It will be a while before I really have real free time. I cannot believe that Des Moines was not on your list of great places you visited this year! I am sure you will put it on your 2016 bucket list. Congrats on going to PT work, which leads to FT awesome, and hopefully more rants. Because if you can’t have fun and laugh at stuff, then what is all this stress and angst worth? Hope you and all the 1500 clan and readers have the bestosaurus Thanksgiving ever! “Bestosaurus!” That is the best thing I’ve read all day! 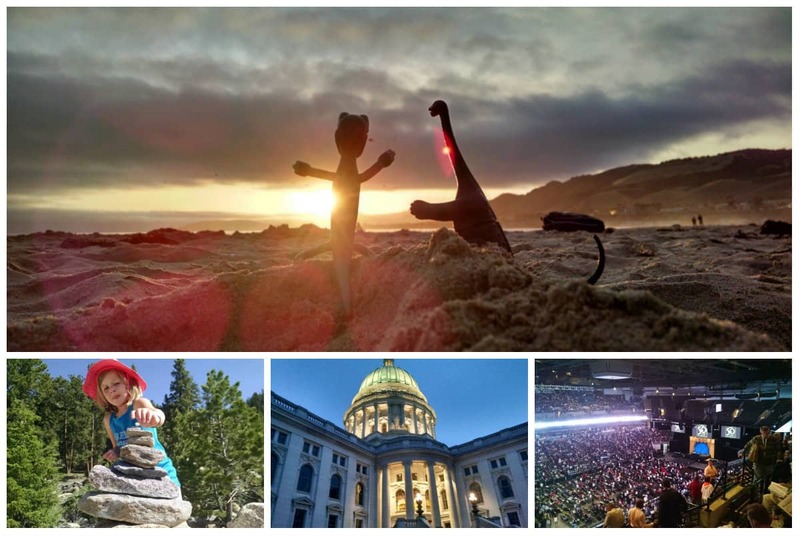 I actually do like Iowa/Des Moines, but had little time to stop there this year. Next July, on the way to Wisconsin, I’ll be spending the night in Decorah. There are not a lot of places to stay in Decorah. But, there is a good BBQ – Old Armory BBQ. Beef brisket, yum! Make their own sauces, low and slow smoked meats. If you have time for a quick meal / refreshment stop in Des Moines, let me know. Or you can pick me up and I’ll go to Jim’s place with you. I can be your crazy aunt Harriet! Mrs. 1500 and I love BBQ, so thank you for the tip. A stop near Des Moines would be great! I’ll talk to you in July. WARNING: may make you drool! We’re all thankful your in the community of bloggers and keep rocking it with great content. Cheers to a good holiday. Thanks a lot Adam! I hope you and yours have a wonderful Thanksgiving too. Happy Thanksgiving! Definitely a lot to be thankful for this year – especially transitioning from full time work! Hope that turns out to be a great change of pace for you! Certainly with your double comma status you can do this no problem! Thanks F40! Happy Thanksgiving to you too! Happy Thanksgiving to your family. You’re right, too many people just over-eat and over-consume on Thanksgiving and totally forget the meaning behind this holiday. Being the backward Canadians, we already celebrated Thanksgiving in October. We were very thankful for having a great year and having great health. Thanks a lot Tawcan! Happy belated Thanksgiving to you too! Happy Thanksgiving and congratulations on going from full- to part-time work! Thank you Bonnie! I hope you and your have a wonderful rest-of-2015. Hope to see you again in 2016, personally I hope to test out the tree fort! Come out to Colorado! It is lovely here in the summer! I’m grateful anyone would want to interview me and I’m so glad I turned down Charlie Rose for you instead. Maggie @ Northern Expenditure recently posted…How We Turned Unemployment Into a Game. And Won! LOL! It’s all good. Thanks for the kind comments! Have an awesome Thanksgiving and Christmas! Also, remember what the police said about that restraining order. You must stay at least 100′ away or else*. Hawai!!!! Which island or islands? Kauai is one the best places on earth! It’s all good though. I mean, can you really go wrong anywhere in Hawaii?!??? (Thinking back of your posts at the beginning of the year, it did not sound like you would take the jump.) I am happy for you! May I ask, how many hours you work per week now? Although we do not celebrate it in Germany (but Black Friday is here now) – happy Thanksgiving for you and your family! And a big hooray for the finished house project. Hi Thomas- I’m only going down to 32 hours per week, but I think it will make a huge difference. Eight hours, especially when the children are in school, will be very valuable time for me to finish projects. And when the children are our of school, I have all sorts of fun stuff planned to do with them. Congrats on moving to part-time, that is awesome! I think the freedom gained from saving $x dollars per month is well worth the journey. I have many friends that will work til age 70, but are happy the way things are in their situation. Asking them to increase their savings rate would almost be offensive! I have actually started spending a bit more lately. I have to say I am thankful for a wife that tolerates my push to save more, but small consumer relapses (for the record- she has them more than I do though). Thanks Vawt! Part-time is going to be great. It is still 32 hours per week, but those 8 new hours are going to be incredible. I’ve been going full-throttle for 15 years. Time to start to slow it down! Happy Thanksgiving Mr. and Mrs. 1500! If you’re travels ever bring you down to San Antonio, drop me a line. I know all the best places to get margaritas! Awesome! I’ve been wanting to visit the Gulf for a while. 2016?!? Very enjoyable post as always. Your bright jokes with seriousness blends very well. Happy thanksgiving. Hope everything goes very well as you planned. I am sure they will and thanks for sharing “How I Built Our Net Worth to $1 Million” posting. So much fun! Thanks so much BSM! The holiday was fun, but so hectic. Good news is that I put up most of the trim in the house! Have a great holiday. Let’s toast to the family arguments! And then cope by drinking some more! Chris @ Flipping A Dollar recently posted…Thanksgiving Holiday – Extend Your Handling Time! Right on Chris! Hope you had a great holiday! Thanks IH! Hope you had a great, conflict-free, alcohol infused holiday!